Excel 2010 (on Codeweaver’s Crossover Office) took 31 seconds to load the file. LibreOffice 3.6.2.2 took 21 second to load the file. Do you happen to have Excel 2007 on that machine to test with? 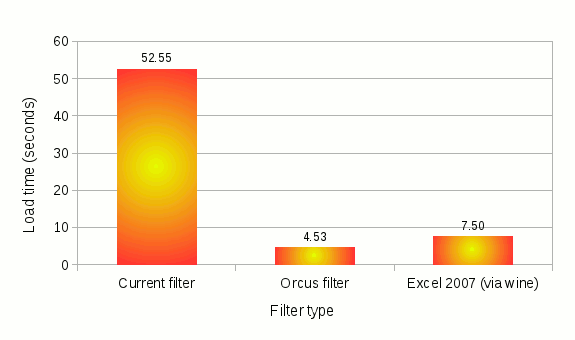 I’m wondering whether Excel’s performance got worse from 2007 to 2010. The fact that 3.6.2 loads the same file faster than the master build does is a bit of a surprise, but I can confirm that on my machine too. We may have introduced a new bottleneck somewhere. Unfortunately, I don’t have Excel 2007 here. On my machine, the result for Excel 2010 is quite stable also in a second test: 29 seconds vs. 20 seconds in LibreOffice 3.6.2.2. This is just the loading time of the file; the applications were already up and running. There might be a regression from Excel 2007->2010, but there is also a slight chance that Crossover has some performance problems with Intel SandyBridge chips, which I already had with Powerpoint 2010 presentations.